Washington – Victims of the partial government shutdown, members of the Coast Guard in Connecticut are about to miss their second paycheck, but few have yet to take advantage of a state grant program that could provide them with thousands of dollars of relief. Funded by state taxpayers who choose to contribute when filing their state income tax returns, the Connecticut Military Relief Fund was set up in 2005 to help active duty and National Guard and reserve members and their families weather financial hardships. Hundreds of Connecticut Coast Guard members who are working without pay because of the shutdown are eligible for the help, too. The fund provides grants in the amount of up to $5,000 and are renewable – that means Coast Guard employees and their immediate family members can reapply for new grants when the money from previous grants runs out. The money is not a loan and does not have to be paid back. 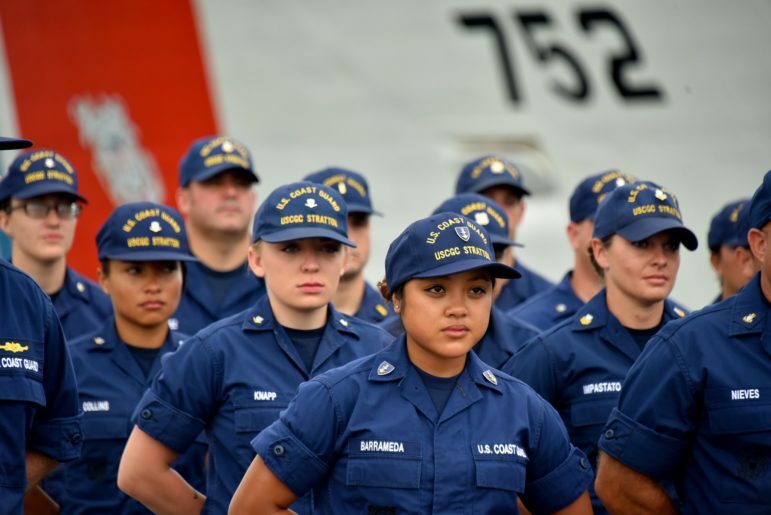 Major Mike Petersen, spokesman for the Connecticut Military Department, which oversees the grant program, says 11 grants have been distributed to Coast Guard members, for a total amount of $35,000 or an average of a little more than $3,300 per grant. Petersen said another 49 applications are in the pipeline. “Decisions on those applications will be rendered very soon,” he said. Petersen said he did not know why more Coast Guard employees are applying for the grants, but expects the pace of applications to pick up. “We encourage every eligible member of the Coast Guard to apply,” he said. To apply for a grant, an applicant must be a resident of Connecticut, be on active duty and suffer hardship because of his or her deployment. Applicants must fill out an application and attach copies of certain documents, including pay stubs, bank records, bills and rent and mortgage statements. Connecticut Coast Guard spokeswoman Lt. Alina Fagan said the Coast Guard is helping its members collect the documents needed to apply for the Military Relief Fund and with applications to other sources of help, including the Coast Guard Mutual Assistance Fund, which provides interest-free loans up to $1,000. Fagan said she “couldn’t speculate” as to why more Coast Guard employees haven’t applied for the military assistance grants. Connecticut has also joined other states in approving an interest-free loan program for federal workers affected by the shutdown. The result of a fierce political battle between President Donald Trump and congressional Democrats over funds to build the president’s border wall, the shutdown began on Dec., 22 because there was no agreement on how to fund nine large federal agencies and several smaller, independent agencies, including NASA. Without appropriations, the Department of Homeland Security, which has authority over the Coast Guard and other affected agencies, was forced to shut down, sending workers who were deemed “non-essential” home without pay. Most, if not all, Coast Guard employees are considered “essential” and required to remain on the job, without pay. Many have made use of pop up food pantries and other help, including free meals at certain restaurants. On Thursday, Commerce Secretary Wilbur Ross, a billionaire, caused a stir by telling CNBC “I don’t understand why” federal workers are needing to go to food banks. Courtney is a co-sponsor of the Pay Our Coast Guard Parity Act, introduced in the House on Jan. 8. The legislation would guarantee pay for Coast Guard members during government shutdowns. A similar bill was introduced in the Senate on Jan. 3. But neither bill has advanced to a vote. Connecticut has more than 1,000 federal workers besides the 400 or so Coast Guard members who are affected by the partial shutdown. On Friday, dozens of federal court employees will be added to that list of affected federal workers in Connecticut as the courts run out of the money from fees, fines and other unappropriated money they have been using to pay personnel. Meanwhile, the Coast Guard reservists are unable to drill and 50,000 retirees may not get their Feb. 1 pension checks unless the shutdown ends soon, which does not seem likely. Acting White House chief of staff Mick Mulvaney has asked federal agencies to provide lists of key programs that could be endangered if the partial government shutdown drags on until March or April, an indication the Trump administration is bracing for a long shutdown.